Hybrid watches are known for marrying functionality with style. They cater to the demographic that prefers the classic look, but with modern smarts. There is no shortage of hybrids to choose from today. But it seems its only going to get better from here. A recent report estimates that in 4 years time, such devices will make up more than a half of smartwatch shipments. In an increasingly crowded market, its becoming difficult to stand out from the competition. 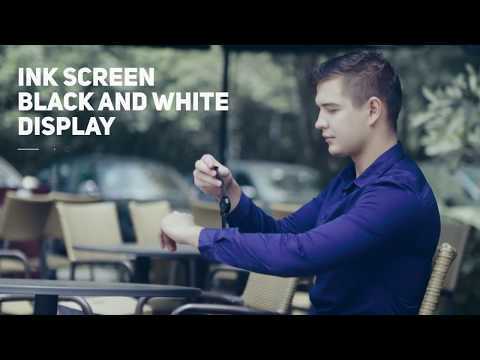 The Gligo E-Ink Smartwatch is hoping to make a name for itself by providing a few unique features. As its name implies, the timepiece comes with an E-ink screen. This makes it easier to read than a traditional liquid crystal display. E-ink looks like printed text, making it easier on the eyes and there is no reflection under the sun. Plus its incredibly energy efficient. And this brings us to the second unique feature. The watch runs an incredible 2-years on a single charge with 180-day e-ink display time. That’s probably the best battery life we’ve seen on any smartwatch or hybrid so far. The gizmo has a two-pin design and is equipped with quartz movement. The e-ink screen displays time, date and notification icons. There is a also little bit of health monitoring and fitness tracking thrown in, including heart rate tracking. GLIGO’s stylish, minimalist design is fit for any occasion. It comes with a 316L fine steel case that can withstand depths down to 30 metres. This means no more worrying about taking off your watch when you’re taking a bath, in the pool or sweating it out. On top of all of this, the device comes with a $99 price tag. Its no wonder GLIGO has generated so much interest on Indiegogo. With 4 days left, the campaign has smashed through its goal 15 times over. Mediorce app and the USELESS watch. Don’t think of buying it. 1. on clicking Up button, a pop up shows up with some chinese text. 5. Connectivity is a BIG issue, watch keeps loosing connection with the phone.